TSUNEISHI SHIPBUILDING Co., Ltd. (HQ: 1083 Tsuneishi, Numakuma-cho, Fukuyama, Hiroshima, Japan; President: Kenji Kawano), is proud to celebrate its 100th anniversary in 2017. We have devoted ourselves to shipbuilding since the 1917 founding of Shiohama Dockyard (later renamed TSUNEISHI SHIPBUILDING) at our current location, prevailing amid the turmoil and rebuilding period after World War II and helping make Japan a global leader of shipbuilding. We extend our heartfelt gratitude to the clients, community, and many other stakeholders who have supported our growth over the years. At the same time, we pledge to faithfully engage in business operations from the perspective of the next 100 years, based on our philosophy of “The pursuit of business stabilisation and development to ensure our employees’ wellbeing”. Katsutaro Kambara, who ran a shipping business that served as the origin of the TSUNEISHI Group, was troubled by frequent marine transport accidents and aspired to build strong ships that would never sink. To achieve this, he founded Shiohama Dockyard and began building wooden ships. Shiohama Dockyard was reorganised and merged with Fujii Dockyard and Nishihama Dockyard of the Tsuneishi area to establish TSUNEISHI SHIPBUILDING Co., Ltd.
Amid a shift from wooden cargo ships to steel cargo ships, we completed construction of “Mikomaru”, our first steel ship. Large shipbuilders built many supersize oil tankers in the 1960s, but no dock in the Setouchi area could accommodate this size for repairs. While engaging in new ship construction, TSUNEISHI SHIPBUILDING identified this ship repair business opportunity and built a 200,000-tonne ship repair dock measuring 330 metres in total length and 54 metres in total width. At a time when shipbuilders were custom-building ships according to cargo type, TSUNEISHI SHIPBUILDING developed the standard ship TESS (Tsuneishi Economical Standard Ship) in pursuit of excellent versatility, low cost, and fuel efficiency. 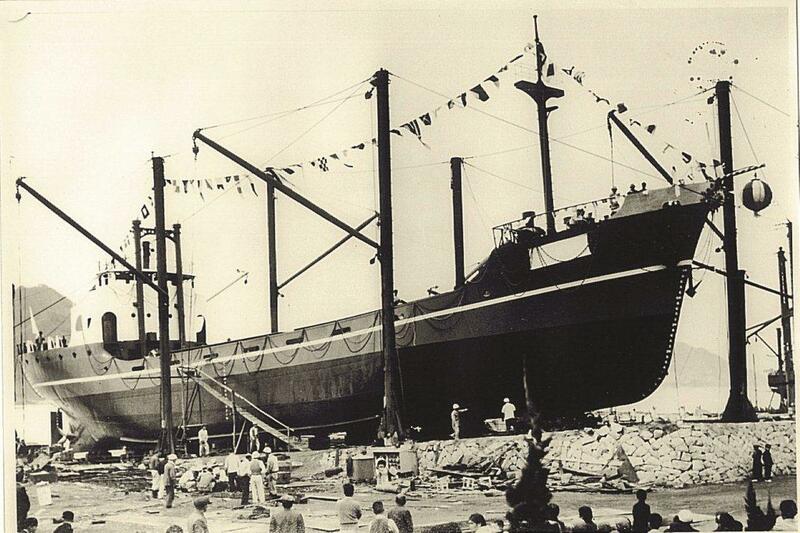 Overturning industry custom, we pioneered a marketing style of proposing and selling standard ships. Since completing our first ship in 1984, the TESS series continues to earn strong sales. As the Japanese economy struggled due to the strong yen, we found new opportunities in the Philippines. 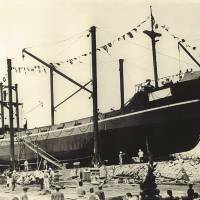 After establishing a local subsidiary and factory, we built a large steel ship in 1997, a first in the Republic of the Philippines since the country was founded. We have since increased our overseas presence, expanding into China and Paraguay. While retaining the breadth to pass through the Panama Canal, we extended the ship length by 4 metres to 229 metres, which boosted the maximum load capacity to 82,000 tonnes. This ship, named KAMSARMAX because it was the maximum length that could enter Port Kamsar in Guinea, has become the industry standard today. Our history over the past century has been a journey of our predecessors overcoming challenges. With the mantra of “Take on challenges with pride”, TSUNEISHI SHIPBUILDING will follow this tradition and pass it on to the following generations.